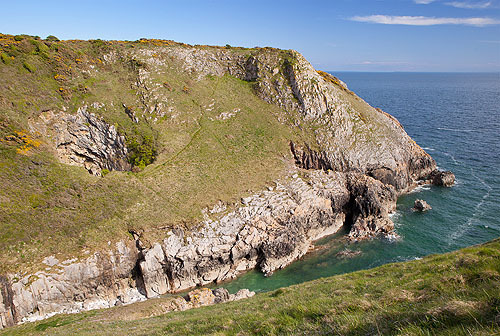 From this viewpoint a blowhole is visible , in the western face of Lydstep Headland. The narrow rocky gulley leads down to Lydstep Caverns Beach. The blowhole is at the rear of Smugglers Cave , which can be entered from the beach on a low tide. In Victorian times steps with railings allowed a route in and out of the Blowhole. It is a tricky descent these days!